The Metal industry is one of the main economies in Barnim and is another of the regions commercial markets. 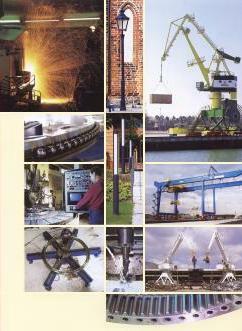 The many companies working in the metal industries of Barnim enjoy an excellent reputation. The county town Eberswalde has a status as a centre for the metal working industries since the 17th century. Companies like: Crane Constructors Eberswalde, Pipe Manufacturers Finow, Rolling Mill Finow – are some names of renown from the past. In recent years some companies have continued this tradition, companies that have been bourn out of the ashes of these former works such as the export-oriented parts suppliers for the automobile industry and it is due to this many faceted industrial background that they are able to considerably broaden their product range. The competence is there, the specialist knowledge and the tradesmen’s know how. The voluntary association between public services, private businesses and enterprises, institutions and societies strengthen Eberswalde and the region as an area capable of targeted industrial operations. Cooperation is the order of the day. Especially in these times of »Globalisation« the regions cluster networks are helping the various branches increase their value to industry. The companies of the »Metal Network« inform one another about their product profile, their production capacity and their workforce situation. Communications strategies are agreed and actions are undertaken and carried out together. Trade fairs, internet presentations and programmes for guiding the next generation in cooperation with the schools are a few working examples. Also local politics and administration, the chamber of industry and commerce and various trade promotion programmes from the Barnim region work hand in hand together with the WITO. The metal working branch has a strong lobby in Barnim. The advantages of the region are at hand. Competence and know-how of the network partners complement one another. Enquiries that are outside the normal production programmes or capacity are offered to cooperation partners and collaboration ensures that contracts are not lost for lack of individual capacity. In short: The orders stay in the region. Through this local cooperation unnecessary transport costs are also reduced. And more: The regional chain of production grows together and is rounded off through a targeted introduction of new suppliers and producers ensuring the further development of the network. The association is a driving force for training and further professional education in research and development. A professional regional marketing programme ensures a cohesive presentation of local businesses on the world markets. Last but not least, new products, processes and clientele are developed. With the »Metal Network« the regions industry is continually carried forward.